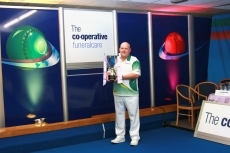 Henselite UK sponsored player Alex Marshall MBE celebrated his first ever WBT title win outside the world indoor championships as he produced a vintage display of bowling to win the Co-operative Funeralcare International Open at Blackpool Newton Hall IBC. Record five times world champion Marshall, who never dropped a set in the event, was sheer class as he brushed aside England's Robert Paxton in straight sets. Marshall, who had only once before reached a final outside the World singles, said: “I'm over the moon to have finally won a title outside the World indoor championships, as I have been trying now for several years.